Sahale Falls is the most easily accessed and pretty waterfall on the East Fork of the Hood River near Hood River Meadows. The falls veil 64 feet down the back of a verdant grotto, with additional drops of 4 feet and 10 feet immediately downstream. 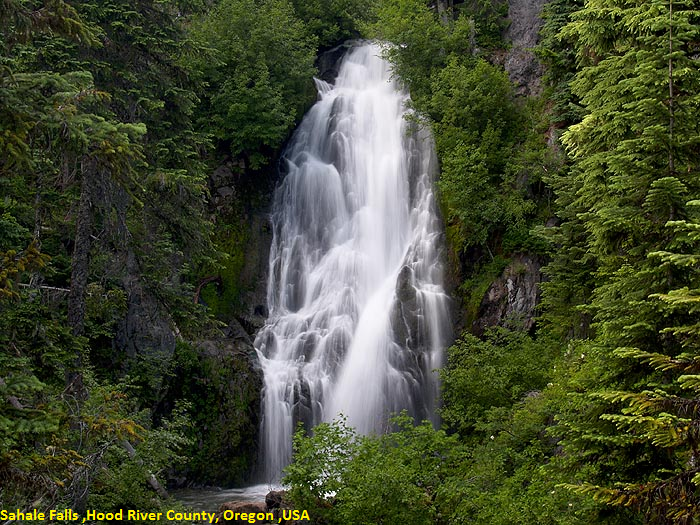 Though the falls are located at a high elevation on the slopes of Mount Hood, which guarantees a consistent amount of water in the river all year. Sahale Falls is found near Hood River Meadows Ski area off Highway 35 near Bennett Pass. Take Highway 26 east from Gresham to the junction of Highways 26 and 35, 2 1/4 miles east of Government Camp. Follow Highway 35 for 7.8 miles to the signed entrance to Hood River Meadows and turn left. After 1/2 mile, turn left again onto the Old Mount Hood Scenic Byway, which is signed for Sahale Falls, and follow the road to its end just before the bridge below the falls in another 3/4 mile.